Planet Earth Poetry is delighted to present its third annual writing retreat, led by Steven Price. Copy of Poets at work. Copy of En plein air. Copy of What a beautiful place for a retreat. Copy of Working in pairs. Photos from our earlier retreats. See you soon! 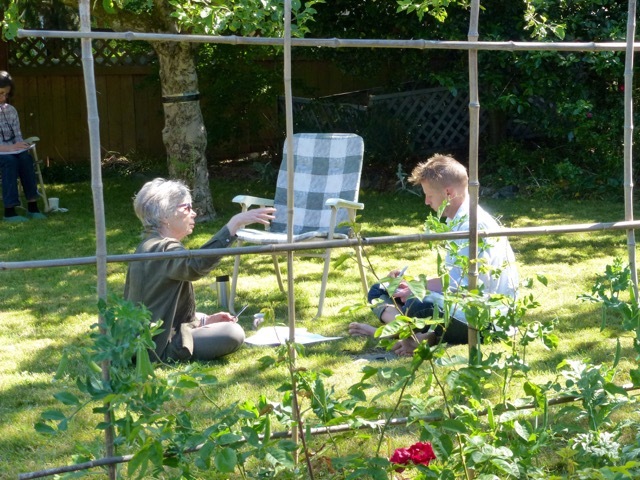 Planet Earth Poetry’s third annual Poetry Retreat will be held on May 27 and 28, 2017, at a Victoria venue. Titled “The Secret Life of the Poem,” the retreat, led by poet and novelist Steven Price, will explore how a poem talks to itself, how it finds a shape or a form that is true to what it wants to be, and how we can begin to tease out some of these formal meanings in our own revisions. The weekend will be an opportunity for poets to sit down together, to explore aspects and elements of poetry, and to think deeply through poetry, in a warm and supportive atmosphere. There will be space for the poets themselves to bring subjects, questions and concerns to the group. There will be time to write. DATE/TIME: Saturday, May 27: 10:00-5:00, Sunday May 28: 9:00-3:00. LOCATION: a comfortable and welcoming home in Victoria’s Gorge area. Details and directions upon registration. Please use this subject line: PEP 2017 poetry retreat. Fee: $225.00. Your cheque will hold your place. *Cancellation policy: No refunds after May 19.